Here’s what’s up in the world of TV for Thursday, March 13. All times are Eastern. 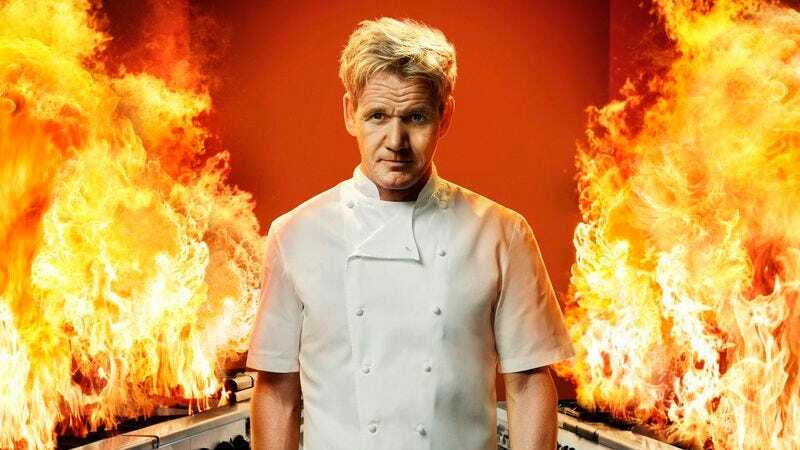 Hell’s Kitchen (Fox, 8 p.m.): Ever since Gordon Ramsay ushered baby chefs into the world in Masterchef: Junior, we have developed a soft spot for him, even though reportedly in those shows that do not feature adorable children he is a total nightmare. Still, we confess ourselves curious; and as the 12th season of the show debuts tonight, we’re looking forward to the devilish fires of Hell’s Kitchen to scorch our tender sensibilities, or something. And let’s be real: We know you’re all going to watch Community anyway! Community (NBC, 8 p.m.): Abed and Annie choose a new roommate. Todd VanDerWerff assumes that his roommate application got lost in the mail. Meanwhile, Shirley, Jeff, and Professor Hickey try to make money off a bunch of textbooks. Sounds like a wacky, accessible storyline with guaranteed laughs! Tell your friends! The Big Bang Theory (CBS, 8 p.m.): Sheldon visits Houston to tour NASA and visits his mother on the same trip, which leads to an ever-widening vortex of mommy issues. Oliver Sava wonders if the writers of Bates Motel have been moonlighting over at Big Bang. Elementary (CBS, 10 p.m.): We just had to call out this episode, which is titled “The Hound Of The Cancer Cells.” It’s a reference! We like totally get it! Myles McNutt is really unimpressed by our “knowledge” of Arthur Conan Doyle’s oeuvre. Star Trek: Deep Space 9 (11 a.m.): Zack Handlen’s Outer Space Fictional Space Station Support Group will meet at the usual time and place. Everyone is requested to quietly and calmly proceed to battle stations for a “routine” drill. Brandon Nowalk took the rest of TV Roundtable on a trip to Texas with his choice of an early episode of the ‘50s Western The Rifleman. And though we can’t say that any of us would be good candidates for cowboy school in North Fork, Pilot Viruet and Sonia Saraiya found “The Marshal” surprisingly moving. Then the three of them get into a long conversation about gender in Westerns, because of course they did! And Phil Dyess-Nugent has a fun argument for us over in For Our Consideration: Whatever happened to Kevin Spacey? Phil traces Spacey’s career, including his House Of Cards success, and examines how this character actor became what he is today—and squandered some potential along the way. Breaking Boston (A&E, 10 p.m.): Apparently Wahlburgers wasn’t enough—Mark Wahlburg has even more aspirations in the reality-television-on-A&E world, and part of that entails producing this unscripted show about six down-and-out young women in Boston trying to get their lives together. The show is touted as being to Boston youth what Jersey Shore is not to New Jersey youth—so… Shakespeare? You decide! Online Dating Rituals Of The American Male (Bravo, 10 p.m.): Well, with a title like that, what could go wrong? King Of The Nerds (TBS, 10 p.m.): With a title like this, what couldn’t go wrong? Le Mans (TMC, 8 p.m.): The original Steve McQueen stars in this documentary-style drama about a veteran car racer and his pit crew. If you are watching RuPaul’s Drag Race while writing What’s On Tonight this description is very funny. NBA Basketball: Lakers at Thunder (TNT, 9:30 p.m.): There are two games tonight, but we’re more interested in this one. The Lakers have had trouble winning against Oklahoma City on their home court, and we, for one, are not eager for them to break their streak anytime soon. Suburgatory: There’s never enough attention paid to this little ABC comedy, but start watching: Brandon Nowalk finds it one of the funniest, if not the funniest, network comedies out there. Last night’s episode is about dating and got an A—check it out.